PARIS -- PSA Group says its joint venture to design and build electric motors with the Japanese company Nidec will put the automaker in a stronger position as the car industry transitions to electrification from internal combustion. The 50-50 joint venture, with an initial investment of 220 million euros, will have the capacity to produce 900,000 motors a year starting in 2022 at PSA plants in France. The motors will be used in mild hybrid powertrains, plug-in hybrid electric vehicles (PHEV) and full battery-electric vehicles (BEV) across PSA’s range. Future considerations include operations in Asia and sales to other automakers, executives from PSA and Nidec said Tuesday in a statement. PSA currently purchases electric motors from Valeo-Siemens and Continental, but the arrangement with Nidec will give it more flexibility to adapt to changing consumer preferences and emissions regulations, as well as manage production capacity, said Patrice Lucas, PSA’s executive vice president for strategy. Under PSA’s Push to Pass midterm strategy, 80 percent of the company’s core models will be electrified by 2023, starting in 2019 with plug-in hybrids in the compact and midsize segments (C and D) and full-electric cars in the subcompact and compact segments. 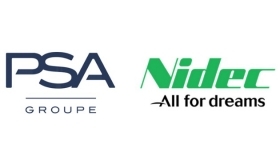 PSA and Nidec will create a “center of competence” for electric components outside of Paris, with an initial staff of 100 engineers. Auto manufacturers are taking a variety of approaches to adapt their production footprint to electrification. In July, Honda and Hitachi set up a similar joint venture to develop and produce engines. Other automakers are more vertically integrated. Renault is producing its own motors for the Zoe and light-commercial vans at its plant in Cleon, France. Tesla has kept all operations in-house. Volkswagen, which plans to spend 24 billion euros on zero emissions vehicles by 2030, will produce its own motors for the MEB platform. BMW makes motors for its i3 and i8 models, largely at its Dingolfing plant. That could change in the future, with more outsourcing as electric motors become more commodified and less differentiated, said Al Bedwell, powertrain analyst at LMC Automotive. Automakers are investing billions to adapt their European plants to electrified powertrains and vehicles, which some experts say will require far fewer employees to produce. The PSA-Nidec arrangement will initially involve 400 workers at PSA’s Tremery, France, powertrain plant, but Lucas would not say if they will be new hires or reassignments. “As we move from traditional ICEs to electrification, we want to make sure that our employees will find the right place within the new structure,” Lucas said. PSA will produce gearing for electrified vehicles at its plant in Valenciennes, in northern France. PSA’s decision to ally with Nidec, which is just entering the automotive powertrain business, rather than a more-established Tier 1 automotive supplier, may be based on a comfort level between the two companies, Bedwell said. Earlier this year, Nidec bought Leroy-Somer, a French company that produces a range of electrical motors and products, including motors for the Bollore BlueCar, used in car-sharing programs, and Citroen’s e-Mehari. The Japanese company’s investment structure for the PSA venture is called Nidec Leroy-Somer Holding.